Description: Corpses infused with crystal shard. Barely held together by their once frail structure. Mongrels are mere husks. Thinly constructed and formed by alchemy. Almost sickly in design. A single mongrel is nothing to be worried about. If ever encountered in a group though, Run. 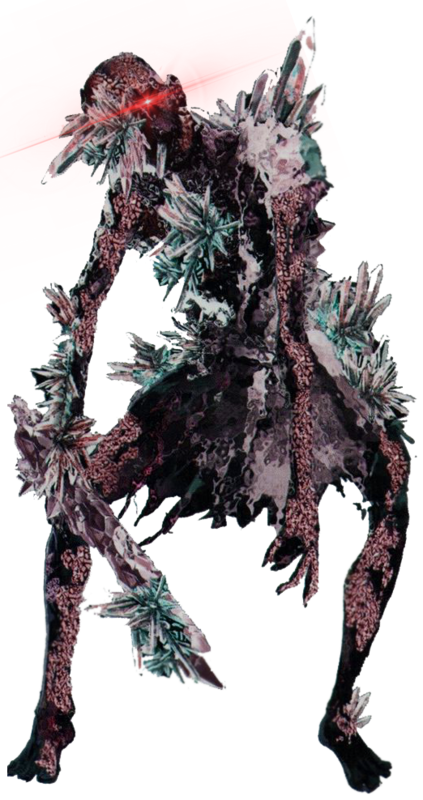 Infection: Oblitus Mongrel are infectious if their crystalline limbs breach flesh. Micro fractured crystals break and are implanted on contact as a means to infect other beings with the alchemical crystal. Once a living host is infected the process takes 12 hours in till the host body is overrun and converted into Oblitus Mongrel. Breathing? : Oblitus Mongrel do not need to breathe and can survive in any atmosphere. Fast! Really Fast: The Oblitus Mongrels are unnaturally fast and can match a humans sprinting speed with ease. With no organs or need for air they can run forever intill death. Must fear and Obey: Obeys the command of their Master, which is Ledgermaynes Essence and soul. Resistant: Oblitus Mongrel are quite hearty. Physically their bodies can withstand average to medium slashings, medium piercing strikes. As for ranged weapons the species is resistant to light slugthrowers for up to a max of 2 rounds. Can resist 1-2 shots from energy weapons such as blasters. Light! : Like any type of sithspawn the Oblitus Mongrels have no resistance to force light and will fall apart instantly. This also works on fragments implanted in a host. Force light can act was a purging cure in early infection stages. Force-Fieldy: Force nullification fields and Ysalamiri bubbles render the Oblitus Bellatoria in a state of weakness. Nullification fields and Ysalamiri bubbles specifically will disable the species entirely in till the field is removed. Meanwhile Void stones will cause the species to grow weaker in strength and speed. Mindless: Cannot reason with others and is considered very feral in nature. Can be outsmarted and tricked easily. Water: Cannot swim or float. Overload: Although not conductive, The species instead act as thermal insulators. Species is vulnerable when subjected to force lightning or enough energy. Their crystalline bodies will melt crippling their current form or destroy them outright. This includes lightsabers. Beating: Especially vulnerable to impact, blunt and explosive damage. Subservient: Without the control or command of their master (Ledgermayne or his essence) the Oblitus Mongrel will enter a state of restlessness and wander aimlessly. Communication: Communicate through groans, screams, screech and body language. General behavior: Oblitus Mongrels two things. Kill and spread. Being to stupid to preform tasks other than gathering materials or corpses, the Mongrels can generally be expected to roam around or dig looking for rocks to eat or corpses to add to their numbers. In combat the Mongrels attack with vicious relentless strikes and grapples. They tend to stay in groups once a group is formed but can be seen solitary and alone. Further tests with Oblitus Shards remain promising but in this case rather disappointing. Interested in what would happen if a shard was placed into an aged corpse buried bellow, a test subject was unburied and the transformation begun. Oblitus Mongrels were born. Not as strong as the first minions brought to life by Oblitus shards, the Mongrels were also noted to be smaller, all to be the same height and general appearance. No hair, thin bodies consisting mostly of crystal clusters on one side and bone or very dry flesh. The Darkside remained to taint their bodies. Judging by their appearance and intelligence level, which was low. This creature was not fated to survive long. Easily outsmarted and overpowered. But what the Oblitus mongrel lacks in alone could be made up for in groups and packs. Further testing proved the Mongrels to be infectious just like the first minions, Oblitus Bellatorias. Although the victims that were struck down by Oblitus mongrels were not to retain their sentience. They would instead become animals in time and eventually mindless like the Mongrels themselves. This process remains similar, 15 hours for the living and 20 minutes for the dead. Another perk to the spawn were their speed and dexterity. In combat mongrels are quick on their feet and hold undying stamina but that ends their positive perks. The Mongrels bodies and forms are too frail to contain the power of the darkside. Within 15 years they wither away. This makes them good for little other than being fodder. Edited by Ledgermayne, 14 April 2019 - 06:21 PM.